When a gal discovers a savvy find, it is her duty to share such good fortune with rest of us gals. Savvy Sis recently found herself the perfect pair of ballet flats, Agnes B lambskin ballerina flats to be exact. According to her, this season Agnes B carries this ultra comfortable pair of flats. Coming from a gal who owns a wide selection of ballerina flats, she finds this pair the most comfortable in comparison to other flats from Tod's, Chanel, Sergio Rossi, Loewe, Chloe, etc. Now I am curious!!! The shape, style, and color of this Italian made flats are simple and versatile for everyday wear year round. As we are partners in shopping crime, I am sad there isn't an Agnes B around me so I can try for myself. Darn!!! Do you like Agnes B. products? 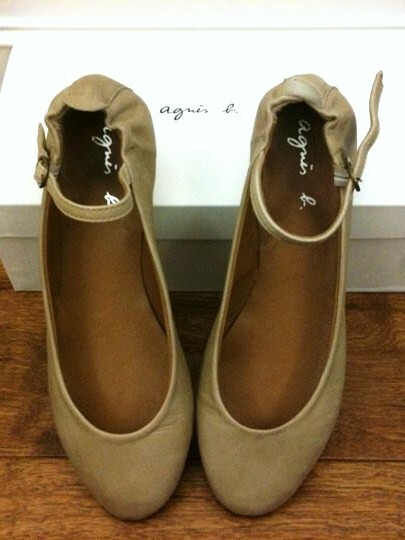 ❤ Agnes b, I used to have a pair, I think I gave it to my sis years ago though. Thanks for reminding me this gorgeous brand!!! These look so comfortable. I just bought 4 pairs of ballet flats at the Kitson outlet store but none of them are lambskin. I need to find the Agnes b store...there used to be one on Robertson. These are cute, and they look super comfortable. I always visit Agnes B. in Taipei. I like the quality and styles are rather simple which is lasting. These are totally fantastic. I can see why you are so in love with them. They're goatskin actually. BAHHHH!!! Oh wait that's a lamb.